Congratulations to Jackie Landis (left), seen here with outgoing Winslow Historical Society Board member Mary Heldt, who won the Ida Hunt Quilt Raffle! 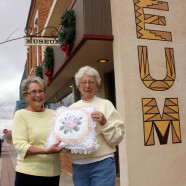 Hunt donated the beautiful quilt and matching pillows (which have a white background with a purple, green, and yellow floral cross-stitch pattern) for the museum to use as the prize in a fundraising raffle. The museum sold over $850 worth of tickets by the time the drawing was held at the 2013 Winslow Historical Society Annual Meeting on November 16! A longtime museum supporter, Hunt has donated to OTM before, generously providing us with a copy of her self-published title, My Town. This comprehensive history of her life in Winslow is available for research at the museum.